Trump, Netanyahu Have 'Very Nice' Phone Call As Embassy Speculation Swirls : The Two-Way President Trump spoke with Israeli Prime Minister Benjamin Netanyahu over the phone Sunday, in their first talk since the inauguration. Trump has signaled a dramatic shift in policy toward Israel. Israeli Prime Minister Benjamin Netanyahu attends the weekly cabinet meeting in Jerusalem on Sunday, just prior to his phone call with President Trump. "The President and the Prime Minister agreed to continue to closely consult on a range of regional issues, including addressing the threats posed by Iran. The President affirmed his unprecedented commitment to Israel's security and stressed that countering ISIL and other radical Islamic terrorist groups will be a priority for his Administration," the statement also said. The conversation caps a particularly eventful day in Israeli politics. Earlier Sunday, the Israeli government delayed its decision on a plan to unilaterally annex one of the largest Israeli settlements in the occupied West Bank. That legislation, which calls for annexing the Maaleh Adumim near Jerusalem, would likely face fierce opposition from the international community. Diplomats from some 70 countries convened last week in Paris to formally warn against such unilateral action, and to advocate for a two-state solution to the Israeli-Palestinian conflict. The same day, however, Israel approved permits to build more than 560 units in three settlements in East Jerusalem, according to Reuters. The news service reports those areas have already been "annexed to Jerusalem in a move unrecognised internationally." 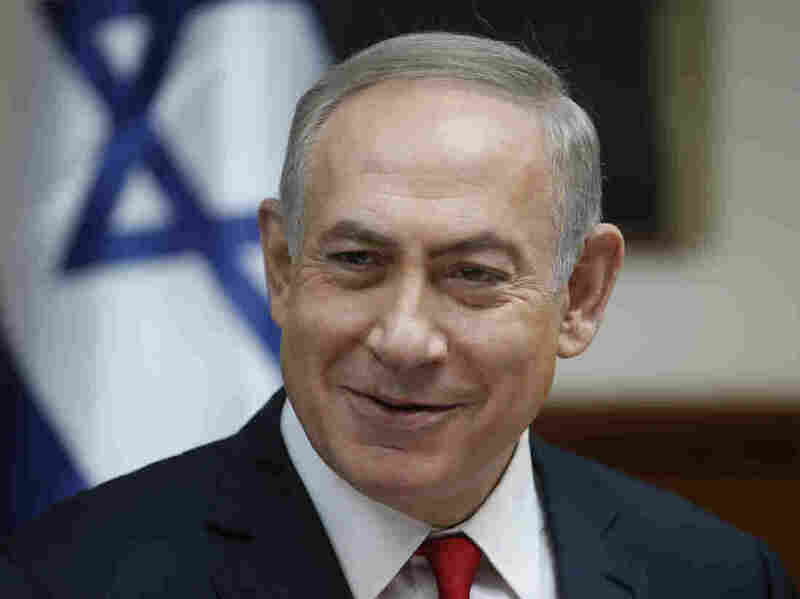 Netanyahu said Sunday that his cabinet members had "unanimously" decided to hold off on a final decision on the annexation proposal in the West Bank until he meets in person with Trump, The New York Times reports. Netanyahu says that meeting in Washington, D.C., will take place in February. In the meantime, there is reason to believe Netanyahu will be dealing with a White House much more amenable to the expansion of settlements than the outgoing Obama administration. Last year Obama's secretary of state, John Kerry, strongly criticized the construction of Jewish settlements on land Israeli captured in the West Bank in a 1967 war; President Trump, however, has given indications his administration will be more supportive of such expansion. While Trump himself has delivered contradictory statements on Israel, he has pledged to move the U.S. Embassy in Israel from Tel Aviv to Jerusalem — a controversial move that would effectively sanction the disputed city as Israel's capital. His pick for U.S. ambassador to the country, David Friedman, has left little ambiguity with his full-throated support for Netanyahu's policies. Friedman, has decried the two-state solution, which would establish a Palestinian state, as "an illusion that serves the worst intentions of both the United States and the Palestinian Arabs." In the statement announcing his nomination, Friedman also suggested he will advocate moving the U.S. Embassy to Jerusalem. "I intend to work tirelessly to strengthen the unbreakable bond between our two countries and advance the cause of peace within the region, and look forward to doing this from the U.S. embassy in Israel's eternal capital, Jerusalem," Friedman said in his statement. Some conservatives were quick to applaud the selection, and to encourage the move of the Embassy to Jerusalem. "We look forward to working with David and the entire Trump administration to cripple Iran's ability to develop nuclear weapons through new and strengthened sanctions, move the U.S. embassy to the eternal capital of Israel, Jerusalem, and repair relations with our greatest ally in the Middle East that have eroded over the last eight years." As NPR's Mark Katkov reported last month, "A law passed by Congress in 1995 requires the U.S. to move its embassy to Jerusalem but allows presidents to waive that requirement, which all have done." In a statement delivered before Sunday's phone call, Trump's press secretary Sean Spicer suggested the administration has already begun to broach the subject — though he remained noncommittal on how far those discussions have come. "We are at the very beginning stages of even discussing this subject," Spicer said.